Dr. Mark Stair, owner of Trucks-ville Dog and Cat Hospital, has operated at 1070 Memorial Hwy. in Trucksville since 2001. Putting his patients first is the number one pri-ority at the hospital that treats dogs, cats and other pets such as lizards and birds. The hospital provides boarding services for the animals it treats. 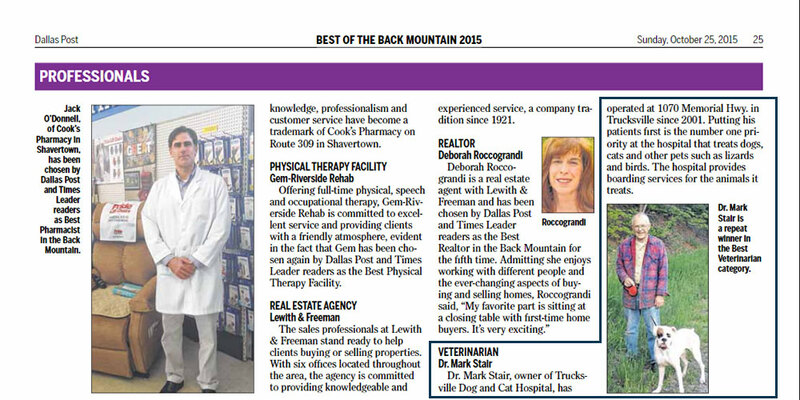 Dr. Stair & The Trucksville Dog & Cat Hospital Win Best Veterinarian & Best Kennel for 2017! Keep Your Pets Safe this Holiday Season By Avoiding These Things!